Looks like we missed a lot while our server was down over the past few days. The most significant piece of news, which you no doubt already know about, is that we now have confirmation that it is illegal in the UK to offend religious people. Should you be foolish enough to leave a cartoon in a public place and a religious person claims that the cartoon causes them “alarm and distress”, you could end up like Harry Taylor with a 6 month suspended sentence, £250 costs, 100 hours of community service, and an ASBO banning you from carrying potentially offensive materials in public (no more Private Eye or Viz for you). Quite right too, Harry Taylor. You did nothing wrong and you should feel no remorse. Despair at the fact that the country seems to have stepped back 300 years into the pre-enlightenment world of draconian blasphemy laws, perhaps. Disgust at the inequity of a law that protects the feelings of a few, provided those feelings stem from religious beliefs. Disdain towards the pansy-arsed cleric, Nicky Lees, whose delicate sensitivities were so injured by a handful of drawings that she felt compelled to call in the police, and towards the jury who agreed with her. But remorse? No, Harry Taylor, you should feel pride. This is the most shocking and regressive verdict the UK has seen this century. Maybe it is time to start a fully-fledged Cartoons on Pews campaign? 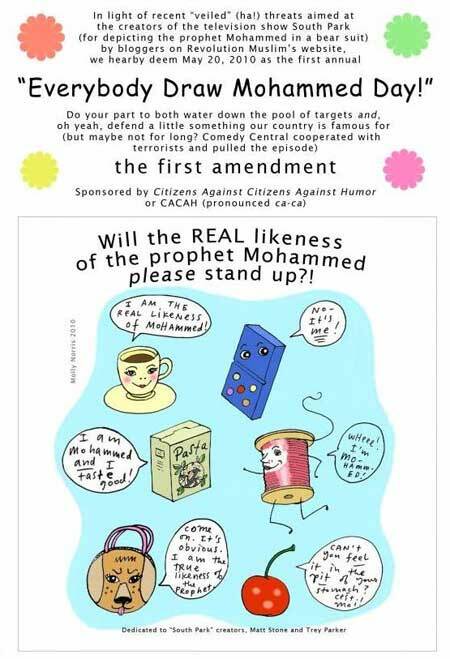 In other cartoon news, the South Park farrago (see below) has prompted an international “Everybody Draw Mohammed Day“, the brain child of Seattle cartoonist Molly Norris. Unfortunately, when her idea went viral Molly got frightened, and has now disowned the campaign. She has removed the above image from her website and replaced it with a drawing of herself. 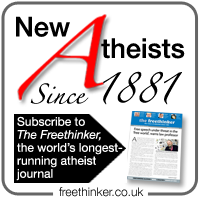 Kurt Westergaard has had a bad week – first having to cancel his appearance at the Atheist Alliance International 2010 Conference for security reasons, then being placed on indefinite leave by his newspaper Jyllands-Posten as a direct result of the attacks on him by extremists. And Lars Vilks, the Modoggie artist, had a lecture at a Swedish University cancelled because fears about Muslim protests meant that no venue would allow their premises to be used. So, the guy insisted that he has done nothing wrong does he? That could perhaps be because he has done nothing wrong. Nicky lees has done nothing but expose herself as a feeble witted bigot. Is your allegedly all powerful god capable of sticking up for himself without you having to go squealing to the police? Well I have news for you Nicky, there are very good reasons why your god is terrified of unbelievers, if there get to be enough of them he goes the Way of Appollo & Zeus. As for this judge he is a total disgrace. Note the lack of press coverage for this compared to the attention given to any Christian who throws a wobbler after being told that their ‘conscience’ does not make them above the law, or rules of their workplace. I notice also that the usual holy pressure groups are staying strangely quiet. Could this be that they are a bit embarrassed at this flying in the face of their all-year-round claims that the religious are the stifled and law-intimidated ones yet can’t bring themselves to publicly defend a militant athiest? Stuart W, very good point. Can’t happen? But this airport is rigorously standing up for faith groups!